In taking inventory, I find that three of my stash of Russian subminis are actually dual diodes, specifically 6X7b-V. Any suggestions as to where I might profitably make use of these? Saggy power supply? (Real tube) clippers? The only datasheet I have been able to find is in Russian, but this appears to be intended as a detector diode, which is, I guess, a full-wave rectifier (because two diodes?) for an envelope detector side chain. Any concrete, specific suggestions, or theoretical help, would be welcome. I wonder if you could press them into service in Merlin's Spark Gap? Hmmm... Fascinating suggestion! In going through that thread, turns out that I asked the same question there! But then I didn't actually have the tubes. Maybe that's why I got them, for all I know, but all that is shrouded in the trainwreck that is my memory. No matter, it's nice to see that tube clippers have been tried and worked, so this is something to examine. Thanks, bluebunny. I think Fender had a patent for real tube clippers. You should try it. I suppose success might depend on the "effective resistance" of the diode, some are low but some are quite high. Yup. Say, Ivan, could you translate any of the numerical data from the datasheet? The datasheet shows that at small voltages (e.g. the signal levels we get in stompboxes) it does not behave much like a diode, more like a resistor. That's no use for a clipper; in fact it looks too linear even to make a diode compressor! 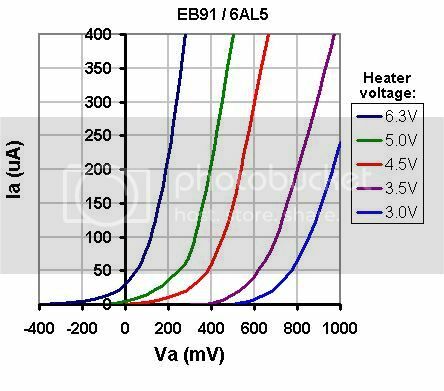 Your first step should be to measure the I/V curve yourself but at different heater voltages. If you're lucky, the curve will shift to the right so it no longer conducts at negative voltages, like I found for the EB91. Then you can use it as a clipper in the usual way (and save some heater power, which is nice). Failing that you'll need to apply a negative bias to the diode to place the idle operating point around -0.6V to -1V where it looks like it behaves itself better.